Fat Quarter Shop's Jolly Jabber: Winners of the Great Granny Sewalong! Winners of the Great Granny Sewalong! Happy Friday everyone! Today, we are announcing our final Great Granny Sew Along winners. We received so many great quilt label entries from our Flickr page and it was a tough choice, but narrowed it down to three lucky winners. 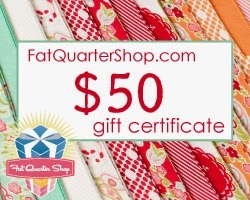 These winners will receive a $50 Gift Certificate to Fat Quarter Shop! Thank you so much to everyone who participated in this fun Sew Along!